Do you have young children or you just clumsy like me? Maybe both! I have been through my fair share of smartphones being destroyed by my children and myself in water. I was so ecstatic and even WOWed when I heard about Splash Proof. It’s one of those products that blows your mind and leaves you a little scared to try. A spray on water resistant coating for smartphones – how can that even work? How can this little spray bottle coat your phone and yet leave it completely free from water damage when the spray is liquid itself. 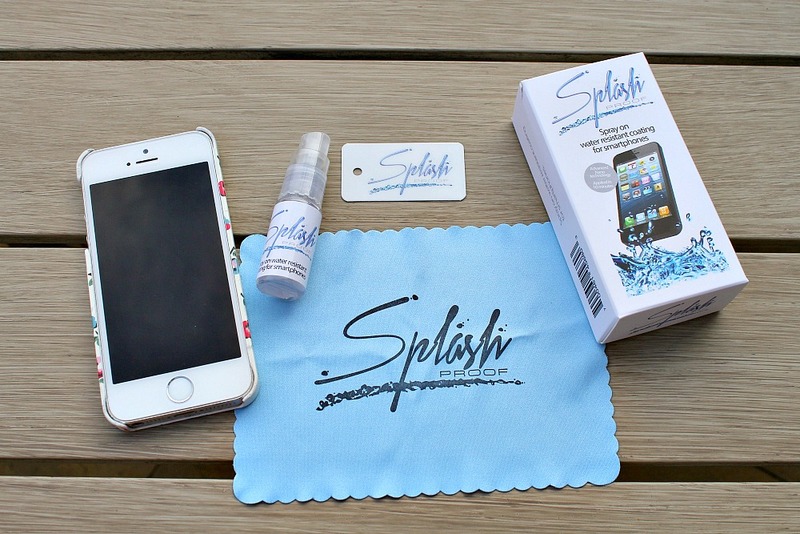 Splash Proof had to have some amazing testing behind it but what a great product to have if you own a smartphone. Most people don’t know their phone insurance won’t cover water damage. After getting a big bill to pay for a new smartphone, I soon found out the hard way. You have to check out how easy it is to apply, in this video below, a few steps to protect your smartphone from water damage. I am so very excited to offer one lucky reader the chance to take their own Splash Proof kit home. You can stop worrying about your kids spilling drinks on your smartphone (as mine did) or spilling drinks on it yourself (I did that too). Enter below. UK residents only! I know Tarana, I was the same. Technology really is wowing us lately. Water fights, I love your kind of summer. Sounds brilliant. Good luck. Best of luck, it’s handy for sure. Wow! I’ve never heard of that. Sounds great. Does it work on tablets too? I’m a kindle bath reader. I am not sure but I don’t see why not as smartphones are the same as tablets just smaller. I can imagine it works on anything similar. Best of luck. I didn’t even know something like this existed, it looks so good! Me neither, but glad I do now. So helpful for a clumsy person like me. Fees standing on your screen??? Interesting… haha Not sure. It did wow me for sure. It really is a waste of money as the fine print is awful on the insurance. I have lost a lot of phones and paid for insurance and there is always something in mine that I don’t get to used it so it’s pointless. Great invention. Get them to enter. It will definitely save your phone. I have lost a few myself. Thanks for entering. I thought so too. I must have watched the video a million times thinking how can this really work??? lol Great invention. Oh don’t say it out loud? That’s cursing yourself. it is inevitable for most maybe you are blessed with safe phones. lol Enter and maybe you don’t have to invest. lol Best of luck. I thought so too. It really does I will admit. Even watching the video I was thinking the same. You must try it to believe it. I hadn’t either and was a little worried at first but it’s brilliant and it was amazing to see that it actually does work. Technology these days blows my mind sometimes. It is totally genius isn’t it? I can’t believe it still – amazed for sure. I know I am so clumsy always knocking over drinks and spilling things near it. It was only a matter of time. So hopefully this saves me. Great invention isn’t it? Technology these days. Well, children or not, that’s a handy thing to have!!! Thanks for sharing! That’s true, you don’t have to have child. I long harmed my phone just by spilling my own coffee on it before I was a parent. lol Best of luck. Thank you so much and to you too darling so happy for you. Good way to put it. I should have used that, “PUT THE RICE BACK IN THE KITCHEN WHERE IT BELONGS” hahaha Great product. I thought so myself. I couldn’t believe it and it still puzzles me how it works. lol But great product. I am with you, it flabbergasted me for sure. I wish I could blame the kids and say I need this in my life now as a parent but lets be honest I needed it long before I become a parent. Clumsy person here. I know I thought so too. You really have to try it to believe it. Every phone should be automatically sprayed with this when we buy it. hahaha Great product. Careful is good but you never know indeed hunny. I used to be and somehow I am cursed lately. Hoping this helps me. I thought it would be great to try as my two toddlers you just never know what they will knock over or throw my phone into. lol Was impressed to say the least. That is crazy mind blowing stuff! How can a little spray protect our phones. That is so super clever! Mind blowing for sure. How can liquid protect from liquid. I just had to try it. Oh yes mine is the coffee problem. lol Best of luck. That sounds like a great idea – those little spills happen so easily with children around don’t they? Or without children around in my clumsy case. hahaha But yes children do up the risk factors highly. Good idea to be prepared. It’s great. You can always enter for a gift for someone else. 🙂 Thanks for stopping by. That is a great idea, have to admit I would be sceptical too, so if it works, fantastic! I think the whole world is skeptical about it so that’s why they are getting bloggers to test it out. lol I was at first too. Don’t worry I was very, very skeptical too hunny. It’s brilliant. Good luck. I soooooo need this! I dropped my brand new phone down the loo less than a month into a 24 month contract. Since then I’ve been using a bunch of old phones that have died one by one… when I buy myself a brand spanking new one, I need this in the house just in case of an emergency!! Oh yes definitely spray that phone as soon as you get it. Best of luck. I cant tell you how many times I have been in the same boat. Oh it took me a few days to give it a go. But it’s one of those products you have to try out yourself. If my husband ever got with this generation and got a smartphone he would definitely need it too. hahaha Good luck. I cycled to work in the rain this morning – without waterproof trousers – this is the sort of thing that would save the contents of my pockets at times like that. Good idea. Best of luck in the competition. Yes that’s the hard part but your trust into a product whole heartedly. Scary isn’t it? Especially how attached we all are to our smartphones these days. Interestingly, this is probably one of the only ways I haven’t destroyed a phone! Am sure I will one day. This looks amazing Jenny. Can’t imagine how it works! I couldn’t either but some how it has the technology to work. The video blew my mind at first. I was completely impressed. I just couldn’t figure it out but it works!!! That’s was is so amazing. Oh yes I think the teens would love this as they are always splashing drinks or tripping and dropping it in puddles etc. Best of luck. Oh yes do it’s brilliant. Great product. Thank you. I know I said the exact same thing hun. It was impressive to say the least. Hopefully saves my phone through a few accidents too. Oh yes wait till the little one is a toddler. It’s game over then. hahaha Good luck. Oh wow! I think we all need this! I have sadly lost many phones due to water damage. Me too and with two toddlers I am surprised it hasn’t been more. lol Best of luck. You can get shatter proof clear cases for your smartphones too hun. They are brilliant. My best friend has one. Best of luck and a great present for your holiday. It certainly sounds like an interesting product! Yes it really is. Will wow you. This is very useful for someone like me that always hang around the pool a lot. hahaha maybe the taste of the spray might keep little mouths off it. lol You never know. I think it’s very naughty and it has cost me because of it for sure. I agree. Oh I am as clumsy as the come there darling. Thank you. Good luck. It really is. Blew me away at first that it can work like that. So true hunny. Best of luck. What a BRILLIANT product. So far, I’ve been lucky and drying my phone out in rice has saved my day, but I’m going to keep this in mind for sure! Oh I think we all feel that way at first. hahaha Good luck.